Tenth State Exhibition: Non-objective Creation as Suprematism [Х Государственная выставка. 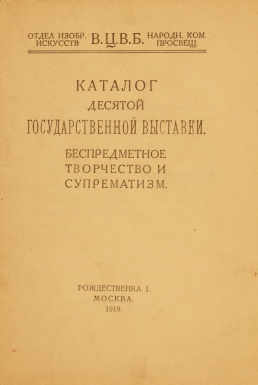 Беспредметное творчество и супрематизм] was the 10th in the series of IZO Narkompros exhibitions, held from 27 April until late May 1919 in Moscow. Participants included V. Agrarykh (Stepanova), A.A. Vesnin, N. Davydova, I. Kliun, Malevich, M.I. Menkov, Popova, Rodchenko, Rozanova (posthumously). The exhibition had manifested the emerging split between Suprematism and Constructivism, although not yet in terminology. The 30-page catalogue contains statements from almost all participants (except for Vesnin and Davydova, in the case of Rozanova some of her earlier published statements were used). Opponents of Suprematism, united under the slogan "non-objective creation", included Rodchenko, Stepanova, Popova, Vesnin. In contrast to Malevich's painting White on White, exhibited for the first time, Rodchenko exhibited canvases Black on Black. There was a schism also among suprematists: while Menkov was unconditionally on the side of Malevich, Kliun attacked him in his manifesto ("Iskusstvo tsveta"). The exhibition was the last joint event of representatives of the then two major tendencies in the Russian avant-garde art. Catalogue texts reprinted in Sovetskoe iskusstvo za 15 let, ed. I. Matsa, et al., Moscow/Leningrad, 1933, pp 110-117. This page was last modified on 15 August 2015, at 22:01. This page has been accessed 3,374 times.